CARDINGTON — The ability of Jordan Deskins to articulate resulted in a winning essay that led to her selection by The United States Marine Corps to attend the 2017 Battles Run Academy in Washington, D.C. last month. 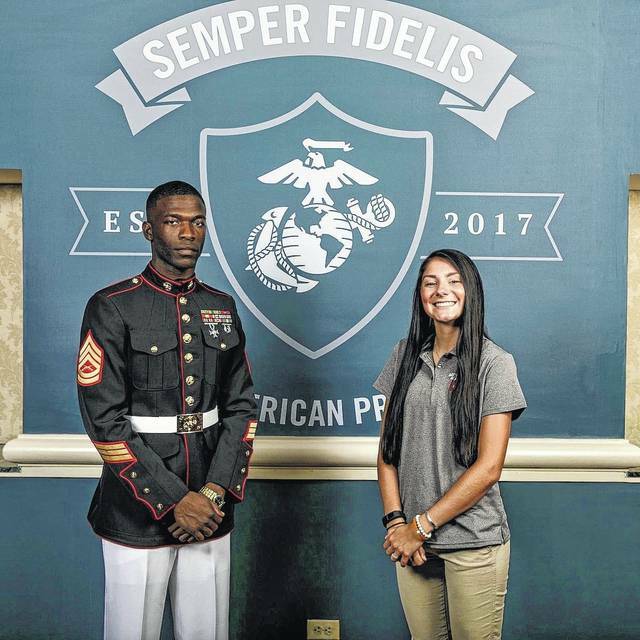 A Cardington-Lincoln High School senior, she received an invitation to the Semper Fidelis All-American Program, a program to which only juniors are invited. The essay subject focused on “Overcoming Adversity,” and Deskins, whose father passed away two years earlier, submitted a moving essay that, combined with her athletic performance, outstanding character, academic excellence, and community leadership reflecting Marine Corps values of honor, courage and commitment won her the invitation. More than 1,000 essays were submitted and only 96 were selected to attend the July academy. Deskins was also one of 12 chosen for a cover story and filming by photographers during her school day and after school community activity in May. The three-day event in Washington DC was attended by 48 boys and 48 girls. From the time they arrived the busy schedule included motivational talks by pro athletes in football, wrestling, baseball, etc., each describing how they had overcome adversity. They visited Quantico Marine Base where Marine officers are trained and the youths learned martial arts and experienced a simulated rifle range. It was here they dined on meals the Marines eat in the field called MRE “and they said I had the worse one,” said Deskins with a laugh. While at Underarmour Headquarters in Baltimore, they experienced Fit Olympics and later participated in a National Mall Scavenger Hunt. They viewed the Washington Monument and saw the Iwo Jima Flag Raising Monument. One of their good will acts was to clear a field in extremely hot weather that was being prepped be a high school football field. “They brought shower stalls out to us so we could shower right there,” Deskins said. The Capitol Hilton Hotel in Washington was their “home” for the duration of the event. She was impressed with its beauty and with the comfort and luxury of the buses that transported them to events. She explained that Inter Sports produced these events, but all were sponsored by the U S Marines. All in all, the three day event was a series of challenges, workouts and viewing of historic sites. Deskins said every minute of their waking hours was filled with an activity and/or workouts. Kirsten Ebert, Cardington-Lincoln High School Student Council and Spirit Club advisor, was Deskins’ mentor and attended the event but was with her only in the evenings. Deskins has college plans at this time to attend Ohio Wesleyan University and eventually teach English as a secondary language in foreign countries but the trip to Washington has given her pause. “It made me think about the military path,” she said, and referenced a trial program the Marines offer where one could go to Quantico for six weeks during the sophomore year of college and then six weeks her junior year. That way, she would not be completely committed and could discontinue the term, if she wanted. To learn more and to view Deskins’ filmed activity at school and in the Community Pantry in May, google Semper Fidelis All-American Facebook Page. She was secretary of her junior class, a member of the student council, the Spirit Club, FFA, FCA, the Spanish Club and Improv. She also plays volleyball. Deskins is the daughter of Heather Deskins. She has one sister, Bryonna. This program is an evolution of the Semper Fidelis All-American Football Program, which recognized some of the nations’s finest high school football players for their athletic and academic achievements from 2012-2016. The evolved Semper Fidelis All American Program seeks to identify and recognize young men and women who are setting an example in a variety of sports nationally. Jordan Deskins with her mentor, Gunnery Sergeant Means. He was her mentor throughout the Semper Fidelis All American Program. https://www.morrowcountysentinel.com/wp-content/uploads/sites/29/2017/08/web1_Jordan-with-her-mentor.jpgJordan Deskins with her mentor, Gunnery Sergeant Means. He was her mentor throughout the Semper Fidelis All American Program. Jordan Deskins in Tug of War at recent Semper Fidelis program. 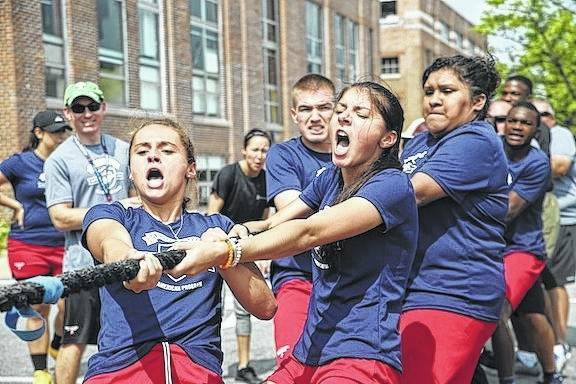 https://www.morrowcountysentinel.com/wp-content/uploads/sites/29/2017/08/web1_Jordan-in-tug-of-war-at-recent-SEmper-Fidelis-program.jpgJordan Deskins in Tug of War at recent Semper Fidelis program.